“If you've got kids, you should have a 529 plan," according to Georgetown University’s personal finance expert Dr. James Angel. "The tax breaks are too good to pass up." The example above shows comparable plans for a couple filing joint taxes in D.C. with children currently under the age of three. They could potentially save $3,000-$6,000 over the course of 15 years by choosing a plan in Maryland or Virginia instead of D.C., based on their income, filing status, tax breaks, and the respective plans' fees/expense ratios. It’s because of the fees, called “expense ratios,” that are tacked onto each fund. "Investment managers don't work for free," Dr. Angel said. "Different money managers charge different fees for their services. Some funds are more expensive to manage. So if you get a plain vanilla index fund, those generally have the lowest fees. If you get funds that do more asset balancing as the child ages, those are more expensive to run, and they're going to have a higher fee." 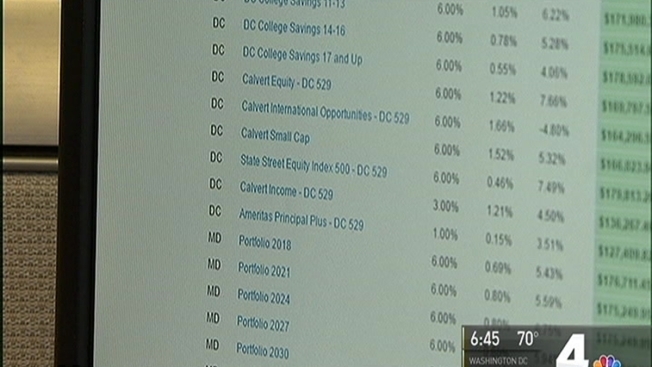 The News4 I-Team found more than half of D.C.’s 529 choices come with fees in excess of one percent. They “are definitely higher than the fees in the neighboring states of Virginia in Maryland," Dr. Angel noted. "If you're paying more than 0.5 percent or 0.6 percent, I'd be asking serious questions of, 'Am I getting services that are worth that much?'" But after looking at the fees and consulting with their own financial adviser, Bye and his wife decided even without paying taxes, the D.C. plans didn’t save them as much money as 529 plans they found in other states. "If they're charging five, six, seven, eight times more than someone else, then I better be getting five, six, seven, eight times more than everyone else, and that didn't seem to be the case," he said. A spokesperson for D.C.'s Office of the Chief Financial Officer, which runs the District's 529 program, initially refused the I-Team's request for an on-camera interview, saying they're prohibited by the Securities and Exchanges Commission from speaking about the program. He also wrote, "We understand participants' concerns and we strive to make the plan as efficient as possible." The CFO's office said the city is also seeking a new 529 fund manager in hopes of offering "a lower overall cost structure" that "will be in a better position to compare the District plan to other states." Calvert Investments, the company currently managing the funds in D.C.'s 529 program, did not respond to the I-Team’s request for comment . The good news, according to Angel, is that 529 plans are "incredibly flexible" -- and you're not limited to investing in your home state. But as Angel cautions, "A lot depends on what the market's going to do, and it's notoriously hard to predict." He held up a tiny crystal ball he keeps on his desk at Georgetown. "I ask, 'Crystal ball! What will the market do?' And I never seem to get a very good answer. All I know is, it will fluctuate."